Playgrounds, turf fields, asphalt roadways, traffic cones, and signs—what do these items have in common? They can all be made from recycled tires. That’s right; thanks to the Tire Recycling Act of 1989 those old tires on your car have been reborn into some creative items. It all started in the 1980s when tire fires created by piles of illegally dumped tires sparked all over the state. The dark smoke and burning rubber was an environmental nightmare. Fast forward 30 years and 80 percent of rubber tires in California serve a better purpose. Forty percent are turned into new products including rubberized pavement for high-traffic roadways, rubberized chip-seal for low-traffic roadways, civil engineering products such as retaining walls, traffic signs and cones, wheelchair ramps, crumb rubber used in sports fields, playground surfaces, and more. The new product is better, too. Not only do these projects give used tires a place to go (other than the landfill), they offer additional benefits, too. Rubberized pavement made with tires is less noisy and keeps those yellow lines vibrant longer; rubberized chip seal is less expensive and is a great tool for resurfacing; rubber used for retaining walls is light weight and drains well; and manufacturer products are better for the environment. A series of grants make tire recycling possible for many. Most consumers simply drop their tires with a salesperson after replacement. The cost of recycling was one incentive for many to simply throw them out, and because throwing away tires isn’t illegal, it was happening often. 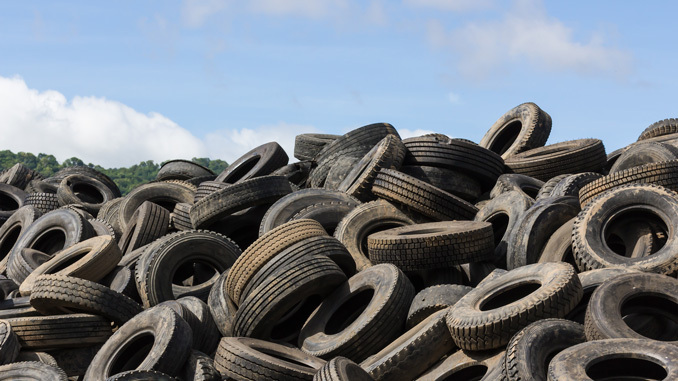 Now manufacturers receive grant money for using recycled tires and tire shops are getting paid for the product instead of paying to recycle, encouraging both entities to increase their efforts. Want to recycle your own tires? Keep an eye out for local amnesty events, or call the Stockton tire-recycling department.